So many workers are cheated out of their pay by employers. This wage theft can include paying a salary without overtime, requiring workers to work off-the-clock, paying workers under-the-table, failing to pay overtime, and not reporting their pay so that the worker is denied benefits, unemployment insurance or social security. The Workers Center and its members say “Enough!” We demand fair pay, and organize rallies and confront employers that fail to pay their workers right. 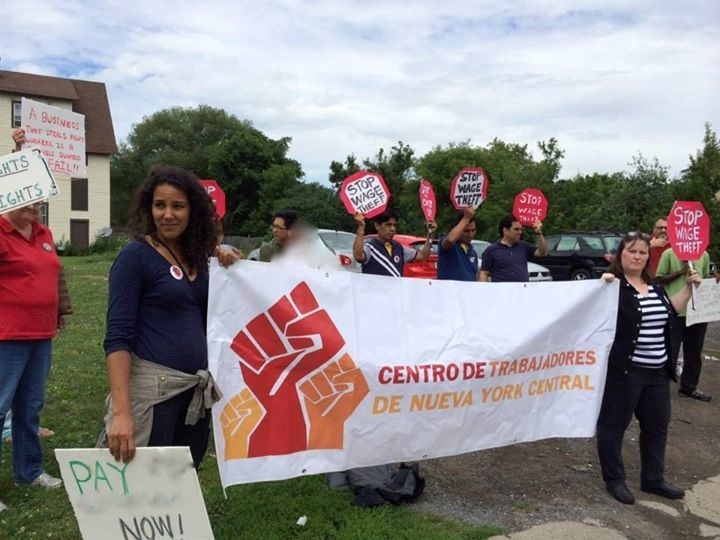 We have received support from the Syracuse United Neighbors SUN to organize Know Your Workers Rights in neighborhoods where workers experience wage theft, and assist workers to file claims with the NY DOL. Yet even this isn’t enough, the NY DOL has a backlog of over two years, and justice delayed is justice denied. So we assist our members in finding attorneys who agree to fight for them and get a fair deal. Yet the fight for all victims of wage theft continues. Lawsuits can help individuals, but worker education and empowerment is the key to ending wage theft. That is why we have to struggle together, to change injustice by building our collective power: a movement of workers looking out for each other! Join us, get educated on wage theft and help educate others so we can END WAGE THEFT!